This is for information of the candidates who have applied in response to this office advertisment No. DPE/17/2017/5- A dtd. 03.2.2018 (Janasanyog/DF/2431117 and Janasanyog/DF/ 2432/17) that the written examination for selection to 13 (thirteen) nos. posts of Junior Assistant in the amalgamet Establishment of Deputy Commissionr's Offfice, Dibrugarh will be held on 18.03.2018 from 10:30 AM to 1:30 PM at the following centres. 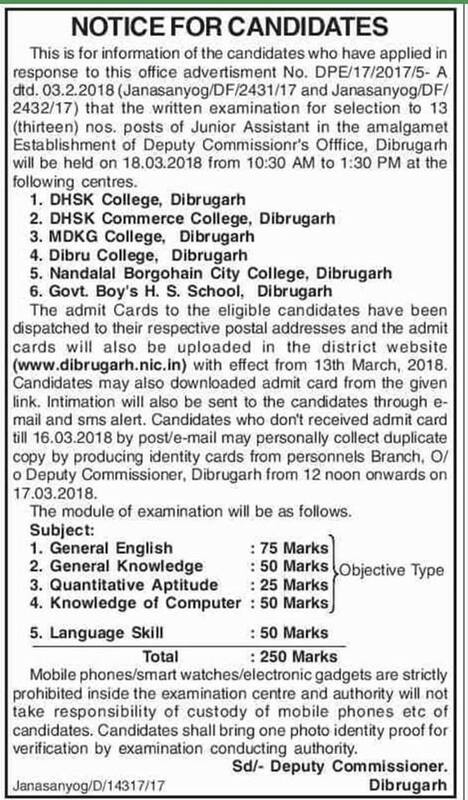 The admit cards to the eligible candidates have been dispatched to their respective postal addresses and the admit card will also be uploaded in the district website (www.dibrugarh.nic.in) with effect from 13th March, 2018. Candidates may also downloaded admit card from the given link. Intimation will also be sent to the candidates through e-mail aces who don't received admit card till 16.03.2018 by post /email may personally collect duplicate copy by producing identity cards from personnels Branch, O/o Deputy Commissioner, Dibrugarh from 12 noon onwards on 17/03/2018. The module of examination will be as follows. Mobile phones/smart watches/electronic gadgets are strictly prohibited inside the examination centre and authority will not take responsibility of custody of mobile phones etc of candidates. Candidates shall bring one photo identity proof for verification by examination conducting authority.